We are wrapping up Reading Awareness Month! This is the perfect time to talk about the importance of daily reading. Whether you are reading at home, at school, at work, or on the farm, daily reading is critical for many reasons. 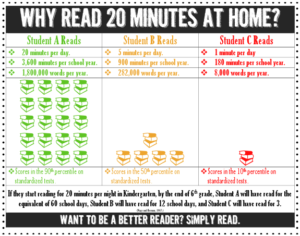 Based on research from https://phoenixacademyomaha.org/read-for-20-minutes-each-day/ , it is SO important for children (but also for adults) to read every day. Take a look at the numbers! 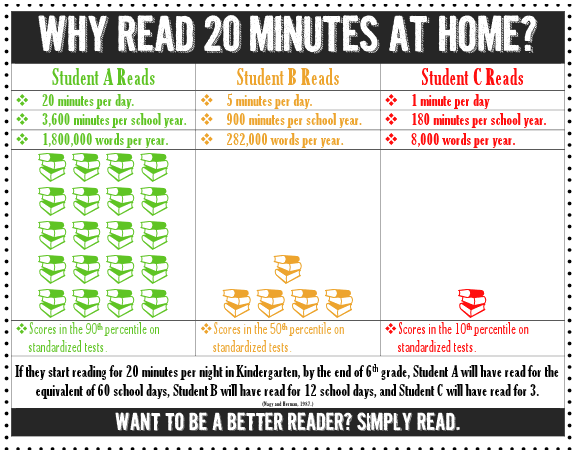 • “Students who scored 90% better than their peers on reading tests, read for more than 20 minutes a day – exposing them to 1.8 million words a year. • Students who scored at fifty percentile, read on average only 4.6 minutes a day – exposing them to 282,000 words per year. For more of a visual representation of this research, take a look at this chart from http://schenkgr4.blogspot.com/2013/04/why-read-20-minutes-pinterest-inspired.html based on the original chart from http://www.usd343.net/vnews/display.v/ART/5060992ac7eb2 . Reading daily for 20 minutes results in learning 1.8 MILLION words a year! We MUST encourage our children to do this each and every day. In an age when playing games and even reading online texts on a phone is the norm, we encourage you to steer away from this ritualistic habit. Encourage your children to hold a book, turn the pages, and feel the sense of excitement and anticipation to see what happens next! As we encourage the importance of daily reading, we also know that there are MANY struggling readers who are terrified to read or have lost that joy of reading – sadly at an early age. There is a book for EVERYONE out there…we promise you! Our volunteers (current certified teachers in the Middle TN area), can definitely help your family find appropriate reading material for everyone in your family. We hope to be a resource for families. 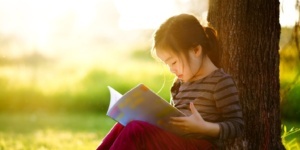 What are some ways to encourage your children to read daily? How can you encourage YOURSELF to grab that book instead of your phone? Take a look at these fun ideas! One program we offer to families is Reading with Rescues. 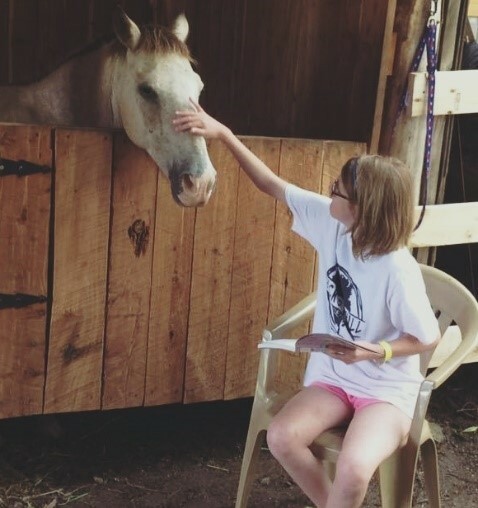 Children and adults are invited to join us on the farm for a reading experience they will ALWAYS remember! We offer a more relaxed reading experience or a more structured tutoring session for your child. A tutoring session would include the child, tutor, horse, and horse handler. Join us for a new book each month! It’s as easy at it gets! Just read, post a comment in response to a few questions we will ask, and then meet up after reading the book on one of our foster farms to mingle and discuss the book in person! While with us, enjoy a cup of coffee, fire, and meet some of our animals! 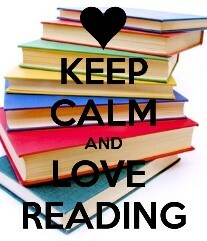 Let your children see YOU reading for pleasure, too! Find time each day to read together quietly – they will understand the importance of reading if they see you doing it daily. Children are asked to read a large amount of required text that may not be too exciting. Their reading time at home SHOULD BE! Visit the bookstore or library together and let them pick out something that 1) they can read independently without a lot of assistance 2)is a topic or genre that they are interested in! Various kinds of texts include graphic novels, comics, mysteries, how-to books, magazines, etc. Help them find an author or series that they really enjoy! They have the sweetest pup that casually walks around and greets guests. They also have a wonderful selection of texts and an adorable area for kids! This bookstore is owned by author, Ann Patchett, and it is the perfect place to visit with your family on a rainy day! We hope this little blog will encourage you and your family to carve out a few minutes each day to enjoy a peaceful time together that requires zero technology…only a book, your imagination, and the willingness to consider endless possibilities. 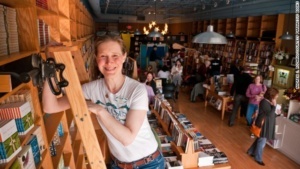 Books open doors for us – especially for our children! *All photos and charts used in this blog were cited and/or found through search to be free to share and use commercially.